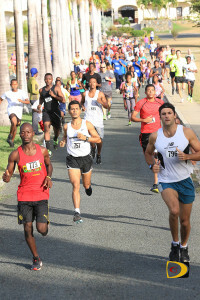 In its 20th season, just over 200 participants kicked off the Highland Spring College Classic Series Saturday on Tortola. Reuben Stoby and Rosmond Johnson who have been dominating the road racing season so far, were the respective male and female overall winners. Stoby covered the course in 11 minutes and 23 seconds while Johnson was timed in 14:15. “I came this morning not sure what to expect and noticed some runners went in front early and decided to see what they were pushing,” Stoby said. “It was a little bit out of my comfort pace so I decided to put a little bit more pace and that did it for me. Shortly after, I noticed I was ahead and nobody chased. Final Results. One Mile Boys: 1. Sam Potgieter, 7 minutes 36.28 seconds. 2. Latriel Williams, 7: 43.57. 3. Jahnare Farrington, 7:55.31. 4. Charlie Potgieter, 7:56.67. 5. Kael Chalwell, 8:16.21. 6. Noah Cottreau, 8:34.14. 7. A. Maduro, 8:44.81. 8. Jahnear Frett, 9:03.46. 9. Kajahni Farrington, 9:39.14. 10. Jamal Harry, 9:42.64. 11. St. Claire Haywood, 9:43.59. 12. Sebbie Morgan, 9:44. 20. 13. Jahheal Frett, 9:45.96. 14. Owen Graham, 9:50.57. 15. Tom Bridson, 10:01.34. 16. Josiah Means, 10:34.53. 17. Seth Dobbie, 10:42.56. 18. Xav Morgan, 10:45.42. 19. Seun Frett, 11:09.14. 20. Joshua Tobin, 11:55.31. 21. Frank Carroll, 13:09.42. 22. Stan Carroll, 13:24.84. 23. Oliver Tobin, 14:31.96. 24. Benjamin Cook, 15:32.92. Girls: 1. Akeela McMaster, 8:23.46. 2. Ashonte Brewley, 8:45.81. 3. Kenniqua Grate, 9:02.31. 4. Asia McMaster, 9:22.57. 5. Tenisha Herbert, 9:30.53. 6. #16, 9:42. 88. 7. Zakaya Stoutt, 9:45. 04. 8. Cheyanne Castello, 9:47:89. 9. Taryn Augustine, 10:06.28. 10. Kivohnya Merry, 10:25.21. 11. Lilly Smit, 10:48.06. 12. Emily Tobin, 10:49.24. 13. Kate Looney, 11:04.99. 14. Angelique Bruce, 11:05.34. 15. Mckenzie Crabbe, 11:08.89. 16. Amia Wheatley, 11:14.71. 17. Amarise McLeran, 11:28.67. 18. Jasmine Santos, 11:56.19. 19. Tiffany Herbert, 11:57.21. 20. Carolie Leboyer, 12:38.99. 21. Felicity Means, 12:48.74. 22. Z’Hara Mclean, 13:09:42. 23. Tiya Herbert, 13:39.28. 24. Ava Ghiorse, 14:47.21. Two Mile, Men: 1. Reuben Stoby, 11:23.25. 2. Vaughn Van Oudtshourn, 12:03.36. 3. Julius Farley, 12:15.12. 4. Tarique Moses, 12:31.72. 5. Samuel Romney, 12:49.73. 6. Adriano Gumbs, 13:05.67. 7. Jomo Rochester, 13:21.52. 8. Mikey Ennis, 13:29.15. 9. Zebalon McLean, 13:45.62. 10. Dave Pettigrew, 14:05.25. 11. Brad Betzener, 14:11.25. 12. Reu Rhymer, 14:37.04. 13. Ikyjah Williams, 15:13.65. 14. Claudius Rhymer, 15:16.18. 15. Ebenezer Joseph, 15:31.16. 16. Chris Graham, 15:56.54. 17. Alric Smith, 16:37.34. 18. Vadley Sylvester, 16:46.80. 19. Clyde Rhymer, 16:49.15. 20. Kenton Brewley, 16:50.67. 21. Stephen Bridson, 17:16.48. 22. Andie Donovan, 17:46.32. 23. Ajaalee Malone, 17:46.68. 24. Aaron Harry, 18:00.25. 25. Howard Moore, 18:14.25 26. Damian Creque, 18:25.47. 27. Jerry Thomas, 19:38.34. 28. Jim Cullimore, 19:44.31. 29. Steve Augustine, 20:04.56. 30. Chris Potgieter, 20:45.21. 31. Stephen Beard, 20:58.16. 32. Ahdan Doward, 21:18.78. 33. Diamonte Gumbs, 21:24.62. 34. John Cullimore, 22:26.84. 35. Devanio Wheatley, 22:30.06. 36. Quadray Daniel, 22:40.82. 37. Djimon Gumbs, 25:38.78. 38. Kadeem Hackshaw, 27:05.78. Women: 1. Rosmond Johnson, 14:15.91. 2. Juliane Potgieter, 15:17.12. 3. Kay Reddy, 15:22.36. 4. Kyra Romney, 15:46.12. 5. Philomena Robertson, 16:34.87. 6. Almarie Maduro, 18:06.66. 7. Sarah Carroll, 18:48.75. 8. Kenyatha Grate, 19:39.62. 9. Sarah Duncan, 19:59.65. 10. Roslyn Gilbert, 20:39.85. 11. Cayley Smith, 20:42.07. 12. Aribella Parsons, 23:23.32. 13. Michelle Dennis, 23:27.16. 14. Khiayah Doward, 23:34.06. 15. Shirley Liburd, 23:55.36. 16. Christina Creque, 25:12.02. 17. Lynelle Gumbs, 25:15.35. 18. Kaiola Rymer, 27:21.18. 19. Riconia Penn, 27:21.77. 20. Alicia Davis, 28:44.41. 21. Pamella Bruce, 30:33.35. 22. Denise Frett, 30:52.59. 23. Valarie Guishard, 31:02.12. 24. Victoria Ghiorse, 31:03.06. 25. Deborah James, 34:59.25. Team Scoring Rules: The positions of the first five members of each team counts towards the scores in this category. The positions of additional members of a team beyond the first five are not factored in. A minimum of 5 persons makes a full participating team. 1. Kenroy Joseph (FLPS-1), 15:43.69. 2. Jahshani Farrington (FLPS-1), 16:02.37. 3. Kadeem Pena (FLPS-1), 16:33.47. 4. Kendi Brewley (AMPS), 16:34.87. 5. Jayden Augustine (PG), 16:41.65. 6. Malike Romney (AMPS), 17:04.88. 7. M’Khori Crabbe (JSPS-1), 18:47.10. 8. Kieanjah Roberts (JSPS-1), 18:50.34. 9. Jahtivya Williams (ASPS), 18:57.35. 10. Johnibel Richards (FLPS-1), 19:04.62. 11. Daniele Walters (WWPS), 19:51.94. 12. Deonna Campbell (ASPS), 19:53.90. 13. Abriel Magloire (ASPS), 19:5838. 14. Jahmarley Frett (WWPS), 20:38.86. 15. Makeda Gumbs (JSPS-1), 20:44.08. 16. Kavon Wheatley (FLPS-2), 21:06.13. 17. Chad Willock (PG), 21:48.29. 18. Ikeyyah Taylor (JSPS-2), 22:33.60. 19. Kashani Farrington (WWPS), 23:13.29. 20. Marik Pemberton (FLPS-2), 23:32.47. 21. Rickey Harewood (FLPS-2), 24:15.00. 22. Frankiesha Browne (FLPS-1), 24:25.52. 23. Angeni Benjamin (JSPS-1), 24:42.02. 24. Kamari Gillings (FLPS-2). 25. Jana Davis (JSPS-1), 25:27.18. 26. Johannes Blok (CP), 26:35.75. 27. Vallesha Guishard (WWPS), 26:41.50. 28. Carolyn Hernandez (FLPS-2), 27:34.44. 29. Aiden Creque (FIPS), 27:36.28. 30. Sanjay Henry (JSPS-1), 28:01.91. 31. Shinique Robin (JSPS-1), 28:03.24. 32. Anica Penn (JSPS-1), 28:20.70. 33. Matai Frett (FLPS-1), 28:24:59. 34. Martina Martin (JSPS-2), 30:27.58. Points: 1. Francis Lettsome Team-1, 38. 2. Joyce Samuel Team-1, 78. 3. Francis Lettsome Team-2, 109. 4. Willard Wheatley, 71 (4 participants). 5. Althea Scatliffe, 34 (3 participants). 6. Alexandrina Maduro, 10 (2 participants), 7. Peligan Gate, 22 (2 participants). 8. Joyce Samuel Team-2, 48 (2 participants). 9. Cedar School, 26 (1 participant). 10. First Impression, 26 (1 participant). Secondary Schools Teams: Cedar School (CS), St. Georges (SGS): 1. Liam Blok (CS), 12:54.10. 2. Tallulah Kinkead (CS), 14:41.25. 3. Robert Wong Jr. (CS), 26:59.65. 4. Aria Creque (CS), 31:17.98. Points: 1. Cedar School, 10. Points: 1. Rotary Club of Tortola, 22. 2. Rotary of Road Town, 48. 3. Rotary Sunrise of Road Town, 8 (2 participants). 1. Tommy Farrell (D), 13:14.35. 2. Anna Kinkead (CSPT), 15:35.70. 3. Iswar Persad (BVTB), 15:51.97. 4. Martin Cherry (HLSCC), 16:49.84. 5. Richie Paul (MSPT), 17:41.35. 6. Ariana Forbes (LF), 17:51.37. 7. Conor Looney (D), 18:29.11. 8. Natasha Chalwell (BVTB), 18:45.90. 9. Elaine Burke (D), 18:52.06. 10. Rhonda Pinnock (BO), 19:51.56. 11. Lucy Hannett (LF), 20:49.62. 12. Garfield Neita (CSPT), 21:09.15. 13. Sarah-Jane Knock (MSPT), 22:47.81. 14. Deidra Thomas (LF), 23:19.28. 15. Marc Brabant (CSPT), 24:34.72. 16. Annelies Brabant (CSPT), 24:35.31. 17. Monet Francis (LF), 26:15.25. 18. Karl Dawson (HLSCC), 26:35.29. 19. Bernice Magloire (D), 27:07.56. 20. Ella Chistopher (D), 27:18.08. 21. Monique Latchman (HLSCC), 27:26.20. 22. Shirley Creque (CSPT), 27:36. 34. 23. Paul George (HLSCC), 27:53.40. 24. Marian Cazabon-Blok (CSPT), 28:03.80. 25. Orlandette Crabbe (JSPT), 28:14.06. 26. Surbhi Williams (HLSCC), 28:40.41. 27. Renesha Stephens (HLSCC), 29:42.40. 28. Rhianna Stephens (HLSCC) 29:42.50. 28. Esme Stephens (HLSCC), 29:42.65. 29. Janvieve Pickett (LF), 29:55.00. 30. Onika Ramsammy (JSPT), 31:02.12. 31. Rochelle Smith (HLSCC), 31:40.40. Points: 1. Digicel, 56. 2. Cedar School Parents/Teachers, 67. 3. Limitless Fitness, 75. 4. H. Lavity Stoutt Community College, 91. 5. BVI Tourist Board, 11 (2 participants). 6. Montessori Parents/Teachers, 18 (2 participants). 7. Joyce Samuel Parents, 50 (2 participants). 8. Black Opps, 10 (1 participant).